This new high-resolution small-diaphragm condenser mic offers high SPL handling and a warm tone. Until the fall of the Berlin Wall the German microphone manufacturer we now know as Microtech Gefell was unknown in the West — yet it was founded by Georg Neumann himself in 1943. Towards the end of World War II Neumann moved his factory from Berlin to Gefell (near Dresden) to escape the Allied bombing, and it was here that the first commercial CMV4A 'bottle' capacitor mics were built using the now-renowned M7 capsule. Neumann eventually returned to Berlin after the War to re-establish the company's head office, while the Gefell factory carried on making his microphones. However, Gefell ended up on the Soviet side of the divided country, making communications very difficult. The Berlin part of the company became the Neumann mic manufacturer we all know about (now owned by Sennheiser), while the Gefell factory continued independently. After the reunification of Germany the Gefell business was renamed Microtech Gefell and was given back to Neumann's heirs to operate as a privately owned company once again. The manufacturer produces a range of very high-quality microphones, many still in the traditions of the early Neumann designs, while some employ extremely sophisticated modern technology. The last Microtech Gefell mic to appear in SOS was the M930, an impressive large-diaphragm mic, which I reviewed back in January 2004. The new M300 under review here, on the other hand, is a small-diaphragm cardioid capacitor microphone. This compact 'pencil' mic is available singly or as a stereo pair. There are lots of small-diaphragm condensers around, spanning pretty much all budgets, from the SE Electronics SE1A, passing through the Rode NT5 and on to the Neumann KM184. However, it is this last model that seems the closest in terms of price and quality to the Microtech Gefell M300. Since I own and use KM184s myself, I'll base most of my subjective comments on comparisons with that microphone. Individual quality-control plots for each of the microphones in a matched stereo set confirm the accuracy of the on-axis frequency response.Photo: Mike CameronThe M300 is a slim, elegant mic with a dark-bronze matt finish to minimise glare and help make the mic almost invisible to the eye and camera. It measures 130 x 21mm, with a weight of 126 grams — for comparison, the Neumann KM184 is 1mm wider, 23mm shorter and 46 grams lighter. Connection is via a standard XLR in the base of the body, and 48V phantom power is required. Both mics have a tidy, well-controlled cardioid polar pattern with similar frontal pickup areas, although the M300 opens out slightly more around the sides at low frequencies. The off-axis responses of both mics are smooth and uncoloured, but I'd say the M300 has slightly better rear null rejection, especially at extreme low frequencies. The obvious differences occur at both extremes of the frequency response. The M300 has much greater low-frequency extension, tailing off gently below about 100Hz to reach -4dB at 20Hz. In contrast, the KM184 starts to roll off from 250Hz and plunges to about -12dB at 20Hz. Of course, the actual bass response achieved in practice will vary with proximity effect, which should be taken into account, but in practice the M300 sounds fuller at the bottom than the KM184. At the high end both mics have a modest treble boost, and on paper the M300's appears the more severe, although this is not perceived to the same extent in practice. The Microtech Gefell mic provides a gently rising slope from about 2kHz, reaching something like 3dB at 10kHz, before the response falls fairly steeply above 12kHz. The KM184 has a similar amount of boost, but it starts higher, at about 5kHz, and has a far more gentle roll-off (which also starts earlier, at about 8kHz), resulting in a more extended top end. Consequently, the extreme high-frequency quality of these mics is quite different, with the M300 sounding slightly 'darker' and the KM184 being a little more 'sparkly' — although these purely subjective impressions are highly dependent on source material, naturally. I was also able to make a direct comparison with the much revered, but now discontinued, Neumann KM84 microphone, and my impression is that the M300 sounds similar, but with a little more presence and a shade less extreme high-frequency extension. 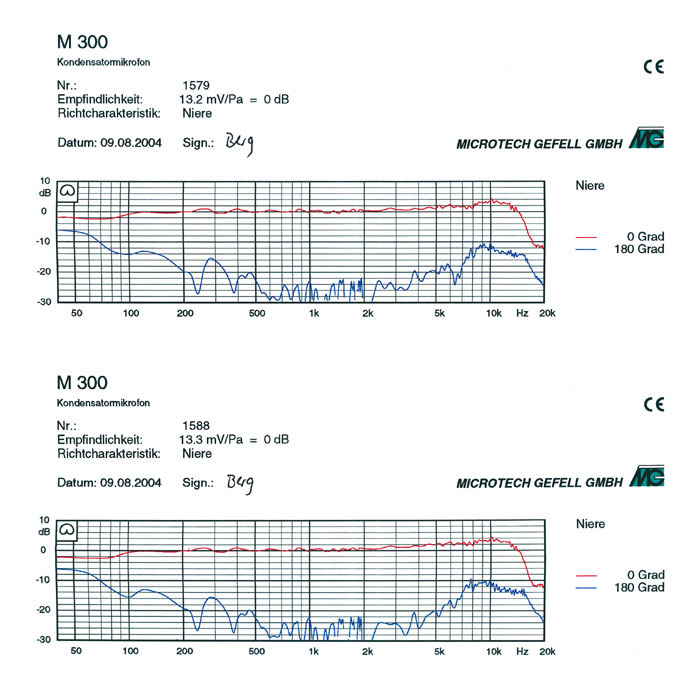 On a technical level, the M300 and KM184 both have similar sensitivities, the Gefell being specified at 12mV/Pa and the Neumann about 2dB louder. Both mics share the same low self-noise figure of 16dBA, but the M300 has far greater headroom, with a claimed 147dBSPL for 0.5 percent distortion — the Neumann is specified as 138dBSPL for the same degree of distortion. To achieve its spectacular 131dB of dynamic range, the Gefell mic is a tad more thirsty for phantom power, requiring 3.3mA as opposed to the Neumann's 2.3mA, but neither figure will tax normal phantom supplies. This is a simple stereo recording of a six-string Lowden acoustic guitar using the two M300 mics reviewed. A single performance on a Simon & Patrick Luthier 12-string guitar, recorded with both Microtech Gefell M300 and Neumann KM184 mics. Another single performance on a Simon & Patrick Luthier 12-string guitar, recorded this time with both Microtech Gefell M300 and Neumann KM84 mics. The basic construction of the M300 is similar to that of most other small-diaphragm capacitor mics, but with several clever twists. Its M3 capsule employs a fairly conventional 16mm mylar diaphragm coated with evaporated gold. However, the housing is made from a ceramic rather than metal, which is claimed to provide far greater consistency with temperature. The ceramic capsule design is borrowed from the very high-tolerance test and measurement mics that Microtech Gefell also make. The capsule is protected with a triple-layer wire-mesh grille at the front, and the large rear-entry ports to the sides are covered with a dual-layer wire mesh. On the electronics side a very clever technique is used to power the circuitry and bias the capsule. The usual DC-DC converter that scales up the phantom power to the required internal voltages uses an optical coupler which effectively eliminates any phantom supply noise or spurious interference. A relatively high 80V polarising voltage is generated for the capsule, which is the key to the impressive SPL handling. Like most modern mics, the M300's output is transformerless. The M300 is designed primarily for radio and television studio work, as well as general music-studio applications and live performances. It is ideally suited for miking up a very wide range of instruments and voices — spoken or singing. The review model was supplied as a stereo pair (with non-sequential serial numbers) in a nice foam-lined wooden box. Included with the mics were a pair of standard clips, a short stereo bar, and an additional threaded barrel to raise one mic above the other when mounted on the bar. The latter enables the mics to be arranged easily in the standard X-Y (crossed cardioids) array or as an ORTF array. A nice touch is the inclusion of a sheet of transparency film printed with full-scale outlines of the mics, bar, and clips, showing how to configure the mics accurately in the ORTF configuration. There were also a pair of quality-control frequency response plots illustrating the very high degree of on-axis response matching. Optional EA21 elastic suspension mounts are available if required, although I didn't experience any significant rumble problems during my time with the mics. I was able to try the M300 out on a variety of sources and found it performed universally well on all — acoustic guitars, woodwind, various percussion (including snare drum), and as a stereo pair for ensemble, orchestral and choral recording. The presence peak seemed well judged to add a touch of air and detail without harshness — even on a notoriously difficult 12-string guitar. The smooth off-axis response ensured no problems with coloured spill when multi-miking, or in stereo applications. 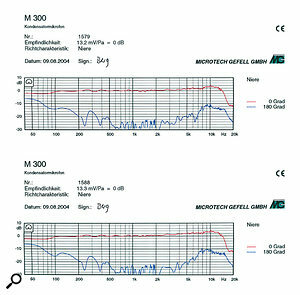 The Microtech Gefell M300 is a very nice microphone indeed — a true all-rounder with a top-notch technical performance. It compares very favourably with the benchmark-setting Neumann KM184, but with a slightly darker tonality that many will prefer. It also boasts a very impressive dynamic range, making it well suited to handling high-SPL sources. If you are in the market for a superlative small-diaphragm condenser I would strongly recommend adding the M300 to your short list — and it will be a very short list! Ability to handle very high SPLs. Very tidy cardioid polar response. Modest presence peak with natural high-frequency quality. Available as a precision-matched stereo pair. 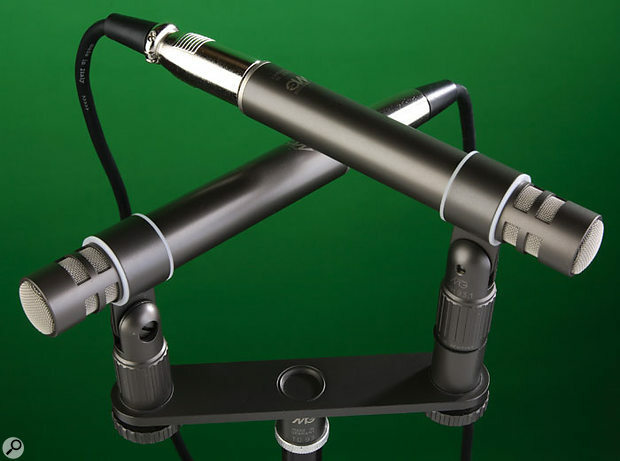 A very versatile small-diaphragm condenser mic with a top-notch professional performance. It has a slightly darker tonality than the benchmark-setting Neumann KM184, and greater dynamic range capability. £546.38; matched pair with spacer bar for X-Y and ORTF recording, £1276.05. Prices include VAT. Sound Link +44 (0)1223 264765.